Russian literary geniuses lived extraordinary lives, and even their deaths became the final chapter of their works. One winter's afternoon, in the woods on the outskirts of Saint Petersburg, two men stood ten paces apart aiming their gleaming pistols at each other. Baron Georges H. d'Anthès, a French officer on Russian service, shot first. The bullet went through his opponent's stomach, and poet Alexander Pushkin plummeted onto the snow. His seconds took the poet to his house in a sleigh. One of the doctors confirmed that Pushkin would not survive. “It is finished. I am going. I can hardly breathe. I'm suffocating,” the poet told his friends. After forty-eight hours of agony, on January 29, 1837, the Russian poet closed his eyes for the last time. This bronze-skinned man (a descendant of an Abyssinian slave in the service of Peter the Great), of limited height and with curly hair was Russia’s foremost poet and was called the “nation’s glory.” Pushkin wanted above all else to be a free poet: “Whom shall we serve ― the people or the State? The poet does not care― so let them wait.” And his defiance earned him a number of periods of exile, many enemies and an uncomfortable relationship with Tsar Nicholas I, who, apart from exercising his regal profession, watched closely over the pens of his writers. Pushkin was always of a restless, incisive and proud disposition, and was an indefatigable Don Juan. His marriage to Natalia Goncharova was received with relief. Finally, l'enfant terrible would settle down. But his wife was an irresistible temptation, even for the Tsar himself. Nicholas I could be a Romanov but Pushkin was the king of jealousy! He wanted to earn money working as a writer so as to be able to take his family, above all Natalia, away from the greedy eyes of the nobles. For this purpose, he founded a literary magazine, The Contemporary, but the reality was disappointing. The income was scarce. Up to his eyes in debt, Pushkin had to accept the court appointment of valet, which obliged him, among other things, to attend the palace balls with his beautiful wife. At this point, he received an anonymous letter which informed him that a supposed Order of Cuckolds had the honour of appointing him as an assistant and official historian. The culprit for his stained honour could only be one man: Georges-Charles de Heeckeren d'Anthès, a fop who aimed at conquering Pushkin’s wife Natalia. The poet had no choice but to challenge his offender to a duel. The news of Pushkin’s death brought together a large crowd in front of his house. Nicholas I ordered police protection for the dwelling and concealed the plans for his funeral, fearing that there would be a revolt. He was buried in the darkness of the night and with great haste at a monastery in Svyatogorsk. After Pushkin's demise, young poet and cavalry officer Mikhail Lermontov in his unofficially distributed poem blamed high society for being complicit in Pushkin’s murder and demanded an exemplary punishment for d' Anthès. Because of that, Tsar Nicholas sent Lermontov to the Caucasus, which was in the state of war at the time, thinking the exile would draw a line under the scandal and would be a good cure for that demented young man. But when Lermontov returned from the Caucasus, he was already famous – not only for his daredevil attitude, but also for his multiple works. In 1841 the poet went back to the Caucasus. In the town of Pyatigorsk there, Lermontov met Nikolay Martynov, his old companion at arms and quite a simple fellow, who desperately wanted to socialize among local noble maidens, parading in Caucasian military uniform. Harsh and dismissive even with his friends, Lermontov chose Martynov as an aim for his bitter and insulting jokes. But Martynov was patient – until the poet started to mock him obscenely in front of women. And that was it – old friends decided on a duel. Two days later, without even holding a religious ceremony (those who had died in a duel did not deserve one), the poet was buried in Pyatigorsk cemetery where a multitude came to pay their last respects. 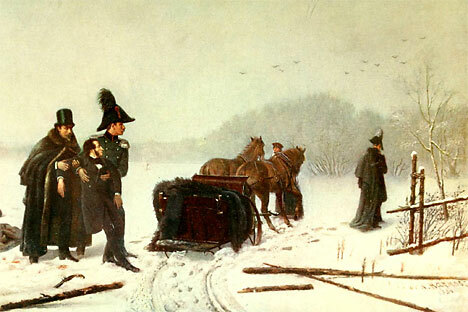 Later, Lermontov's body was taken to the family vault in the Tarkhany estate (province of Penza). The astonishing fact is that in his most renowned novel, “A Hero of Our Time,” finished a year before his death, Lermontov describes a duel between the protagonist, named Pechorin, and a careless tattler Grushnitsky, a character very much like Martynov. In the novel, Pechorin kills Grushnitsky. The real life turned out to be exactly the opposite.